If you are looking for a business opportunity in Iowa then you should definitely consider investing in a BBQ grill and cleaning business. There is no reason to worry about starting this business even if you feel like you will have to make a huge investment or you think that it will require a significant amount of expertise to be able to operate and manage one. The truth is you do not need to spend too much to be able to run this type of business nor do you need many years of experience in the BBQ cleaning industry. Yes, you read that right! You do not have to spend much and worry about monthly or yearly royalty fees. We are not a franchise but a team you can rely on to grow your business. At the BBQ Cleaner, we get requests from residents in Iowa and we will need many potential businessmen who are interested to help us reach more homes in the state. By working with us, you can be sure that you can setup your business easily, grow it with our help, and enjoy setup rates that are most reasonable for you and your customers. Why Start a BBQ Cleaning Business in Iowa? Favorable Weather: Weather will definitely work on your favor when running a BBQ grill and cleaning business in Iowa. The state has extremely hot summers and mild winters thus giving you assurance that families will be out most of the time to enjoy an outdoor grill session. This will give you the opportunity to offer your grill cleaning services. Growing Number of Potential Customers: BBQ festivals are very popular in Iowa thus it will be fairly easy to look for a market a BBQ grill and cleaning service. Scarce Competition: You can be sure that there are only a few competitors in the world of BBQ grill and cleaning services in Iowa. Grow Your Business According to Your Needs: You can easily grow your business where you need it, and when you need it. Add more vehicles or hire more people to meet client demands. How Does The BBQ Cleaner Help You Get Started in Iowa? There are many perks to enjoy if you decide to invest in our one-stop solution. First, you will be given access to lifetime business support from the BBQ Cleaner. This will help you grow your BBQ cleaning business successfully. Since our inception in 2009, we have already grown our business nationwide with over 180 operators to date. With many years of experience in the BBQ and grill cleaning industry, you can be sure you will easily unlock your earning potential in the world of grill cleaning services. 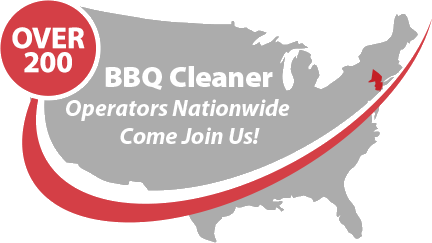 Talk to us today to find out more about this stellar BBQ cleaning business opportunity in Iowa!